There’s nothing sweeter than receiving a hand-made card for the holidays, so I’m going to show you how to make one! 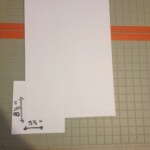 First, cut a piece of white cardstock to measure 8 1/2 inches by 5 1/2, and fold it in half so that it’s 4 1/4 by 5 1/2. 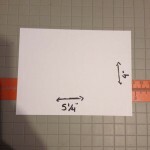 You’ll also want to cut a piece that measures 4 inches by 5 1/4. This will be a layering panel. 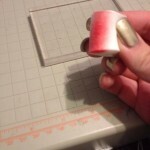 Next, cut your patterned paper in little squares and rectangles. Mine measure 1 inch by 1 1/2 inches, 1 1/2 inches by 1 1/2 inches and 1 1/2 inches by 2 inches. 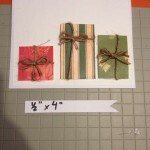 Cut pieces of twine or ribbon that are slightly wider and longer than your patterned paper. You’ll need two per square/rectangle. 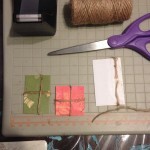 Place your patterned paper face down on a piece of twine and tape the ends of the twine to the back of the paper. Do one horizontally and one vertically. You can center them or put them off to the side to add interest. Put a liberal amount of hot glue on the back of each shape and let it dry. 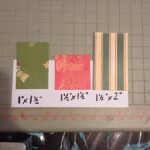 This will give it some dimension so that they aren’t just flat on the card. 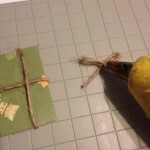 Tie little bows out of the twine and add a little hot glue over the center. 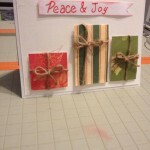 Add the bows to where the two pieces of twine cross over each other on the patterned paper. 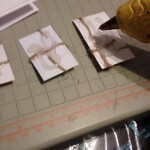 Add more hot glue to the back of the presents and stick them on the card. I went for a simple row of three gifts. While this is drying, cut a piece of white cardstock that measures 1/2 inch by 4 inches and cut a little triangle out of one side to make a banner. 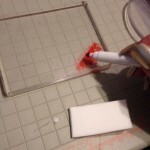 Scribble on a piece of plastic with your marker and pick up that scribble with a makeup wedge that is folded in half. 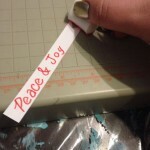 Swipe the makeup wedge along the edges of that banner strip and write a sentiment on it with the marker. I chose to write “Peace & Joy” on mine. Add some hot glue to the banner and put it on your card and voila! Your card is done. Write a cute little message on the inside and it will be ready to send out!